I HAVE news for APC stalwarts. You don’t win an election in Nigeria by being the champion of social media. You don’t win by renting crowds to fill up your rallies. You don’t win by putting up your billboards everywhere while tearing down those of your opponents. You don’t win by master-minding in the media a false sense of the inevitability of your victory. When you do all this successfully, you simply end up deceiving yourself. You win elections by mounting an effective ground-game at the grassroots level; designed to bring out the people on Election Day to vote for you. Instead, APC strategy was to stampede the electorate into victory. The design was to proclaim victory even before the election, laying grounds for protests and acrimony in event of defeat. The APC blueprint is see-through. Present a new refurbished, suit-wearing and church-visiting Buhari to the electorate chanting a mantra of “change.” Give him a Teflon-coated Redeemed pastor as vice-presidential running-mate. Shield him from public scrutiny and debates to hide his weaknesses and absent-mindedness. Gloss over his objectionable past and pedigree. Mount an aggressive image-laundering social media campaign. So doing, before the PDP and the public would be up to your game, the election would be over. Nigerians would wake up on February 15th to discover to our cost that we had been hoodwinked into handing over power to Buhari and the Tinubu cabal. The APC mechanism for perfecting this plan entailed bullying the PDP into defeat. In the North, PDP supporters were threatened and harassed. Some quickly packed their bag and baggage and left town. Even Goodluck Jonathan’s convoy was stoned by APC “democrats.” In Gombe, a suicide bomber paid a courtesy call on the president’s campaign rally. But the killer-punch was to be the disenfranchisement of literally millions of PDP voters. With the complicity of Jega’s INEC, APC strongholds were supplied with PVCs: while PDP strongholds were denied them. Ghost-voters came out of the woodwork by their hundreds of thousands in unlikely places like the war-torn North-east to collect their PVCs. However, in peaceful higher-population places like Lagos and Kano, non-indigenes were denied their PVCs, suspected of being likely PDP supporters. It is telling that, in all the ensuing brouhaha over 23 million people not yet receiving their PVCs seven days to D-Day, APC remained resolute that the election should go ahead nevertheless. This indicates that it knew the missing PVCs belonged disproportionately to PDP supporters. However, the entire strategy of the APC met its Waterloo with the postponement of the election. With the postponement, the Buhari election-train came to a screeching halt. Some have argued that the postponement was a military coup by Jonathan and the PDP. However, a more truthful assessment is that the postponement scuttled the APC plan to win the election by subterfuge. APC blundered because it refused to entertain the possibility that the election could actually be postponed. As a result, it did not plan for that eventuality. In this gaffe, it was carried away by its own hyperbole. APC big-guns shouted themselves hoarse warning all and sundry that the election must not be postponed, or else. Worse still, they believed their own rhetoric. APC is used to making threatening noises. It is all stuff and bluster. If it loses, the dogs and the baboons would be soaked in blood. If it loses it would form a parallel government. If the election is postponed, Nigerians would not stand for it. Therefore, it expended all its political and financial capital on a 14th February election. When it finally dawned on it that the election might be postponed, Buhari made an unusual visit to the Council of State to mount a pathetic eleventh-hour resistance. But alas, the APC was completely outplayed. INEC succumbed to the inevitable and the election was postponed, and for six weeks no less. As a result, the APC stampede came to an end. The orchestrated Buhari momentum came to a screeching halt. Since then, APC pundits have been in shock; scratching their heads because, in all their impetuosity, they had no Plan B. The APC was banking on the element of surprise. That is now gone with the postponement. It was hoping to win the election by disenfranchising PDP voters. That is no longer possible. It is now confronted with fighting an election it always knew it cannot win because it does not have the appropriate structure on the ground at the grassroots level. Sixteen years in power had made the PDP over-confident. It seemed to have been caught unawares by the scripted APC nomination of Buhari and the gimmickry of choosing a Redeemed pastor as his running-mate. As a result, an election that should have been a cake-walk for it suddenly turned into a tight race. Part of this was self-inflicted. PDP had a bad set of primaries; creating considerable dissension within its ranks. Moreover, the PDP was bested in the public relations department; allowing the APC to define the narrative of the election on social media. Had the election gone on as scheduled on 14th February, it would have been close but Jonathan would still have won. But with six weeks delay, the election will not even be close. Even though it was ebbing discernibly, APC had momentum for the 14th February election. By 28th March, that momentum would have dissipated and disappeared. Even now, the momentum is no longer there. Buhari is in London on a dubious visit. APC has run out of breath. Make no mistake about it; the six week postponement of the election has effectively crippled the APC. It is no wonder then that the party has been grumbling non-stop. In the meantime, PDP has been able to get a full measure of the APC. Putting all its eggs in the 14th February date, which it insisted cannot and must not be changed; the APC played all its cards. It put all its eggs in one basket. However, PDP held some in reserve, banking on the postponement of the election. What happens now? APC is confused. It is stretched for funds. It has lost its mojo, scrambling in panic mode to raise additional 50 billion naira from donors. 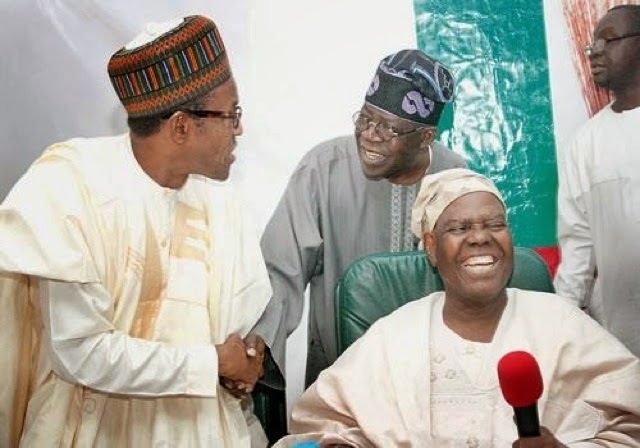 Speaking to APC stakeholders at the party secretariat in Lagos, Bola Tinubu said: “We have to re-strategise; all of you should go back to your various constituencies starting from tomorrow.” This is a belated acknowledgment that the party now likely to win the election is the one best able to mount an aggressive and effective nationwide grassroots campaign. In that department, the APC is clearly second-best. The party best positioned to mount an effective ground-game and mobilize votes at the grassroots level is the PDP. It has been around for 16 years. PDP local government councilors account for nearly 70 per cent of all councilors in Nigeria, comprising 6,521 members, making it a truly grassroots-based political party. The APC, on the other hand, does not have the nationwide political structure to win the coming election. To date, it is a newspaper and television political party. It has yet to build a formidable grassroots support. It is a JJC party, a little over a year old. With all the noise about Buhari, it should not be forgotten that the man chronically lacks skills at building political party structures. In the APC presidential primaries, Northern delegates did not even vote for him; preferring instead Kwankwaso and Atiku. He was elected primarily on the strength of ACN votes. PDP strength on the ground everywhere in Nigeria explains why Jonathan was able to win 37% of the vote even in Buhari’s home-state of Katsina in the 2011 election. While APC was busy stoking up the press to create its air of inevitable victory, PDP was busy mobilizing its local government councilors. Its Presidential Campaign Organisation brought all its elected and appointed councilors from all over Nigeria to Abuja to mobilize them to secure victory for the party at the grassroots level. In what was captioned “Operation Deliver Your Ward,” Professor Jerry Gana re-fashioned them as political foot-soldiers and grassroots mobilisers for the PDP, split into six groups according to their geopolitical zones. Since the postponement, Jonathan is no longer the issue. It is once again Buhari; the coup-plotting former dictator and alleged ethnic and religious jingoist. Thanks to the postponement, Nigerians can no longer be panicked into voting for Buhari. We now have enough time to appreciate that he is old, and completely bereft of ideas as to what to do when in power. It is not enough to shout “change, change.” The question is: change to what? To this question, Buhari provides a deafening silence. In the meantime, the true message of Jonathan’s considerable achievements in office is now resonating. With the commissioning of new power-plants, we are now generating 5,500 megawatts of electricity: a new Nigerian record. We now know from PricewaterhouseCoopers that the allegation that $20 billion is missing from NNPC accounts is one big fat APC lie. The army is now fully-equipped for battle. For the first time in a long time, the Nigerian air force has come into the fray. The Boko Haram is being bombed to smithereens up North. There is even talk of capturing Abubakar Shekau alive. Within the next six weeks, all that is left is for the PDP to put its house in order and APC will be toast. Since Buhari has whipped up himself and his supporters into an unrealistic psychological frenzy in this election cycle, it is certain he will end up at the tribunal, when it finally dawns on him that, in spite of all the bluster, he has lost again. The fate awaiting Buhari brings to mind that of Mitt Romney who was so deceived into believing he would be elected America’s next president in 2012, he had only a victory speech on election night when he was roundly defeated. When the history of the 2015 presidential election is finally written, it will be recalled that the postponement of the election for six weeks was the final nail in the coffin of the APC.